In an interesting juxtaposition of roles, Jim Wilson, a principal software engineer at Brightcove, is straddling the line between the worlds of online video and print publishing. As part of the end user experience team at Brightcove, Jim helps develop the features and functionality that allow viewers to easily interact with Brightcove’s Video Cloud Smart Players on devices and screens of all types. He has also become a published author with the recent release of “Seven Databases in Seven Weeks: A Guide to Modern Databases and the NoSQL Movement,” a book he co-wrote with his good friend, Eric Redmond. Working at Brightcove, Jim is also keenly aware of the vital role that video plays as part of the overall marketing mix. To promote the book, he produced the music video, "Seven Databases in Song," which can be seen below. 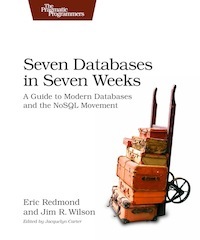 Published in May, “Seven Databases in Seven Weeks” is available as a paper book or ebook at from The Pragmatic Bookshelf.